It seems a long time ago since the national newspapers dominated Results Day, and the subsequent clearing frenzy, in the UK. This year we had an explosion of content – infographics, vines, animations and much more – pulsating through a huge range of channels. In many ways, #Resultsday in the UK felt like an epiphany in the recent history of digital HE marketing communications. It was as if the whole sector has been frantically upskilling in the last 12 months and suddenly unleashed everything it had learned. We took a few hours to watch the action and gathered enough from 16 Universities to showcase some of the big trends. Lots of Universities were tweeting like crazy, welcoming new students with smiley faces, virtual high-fives and fireworks galore. 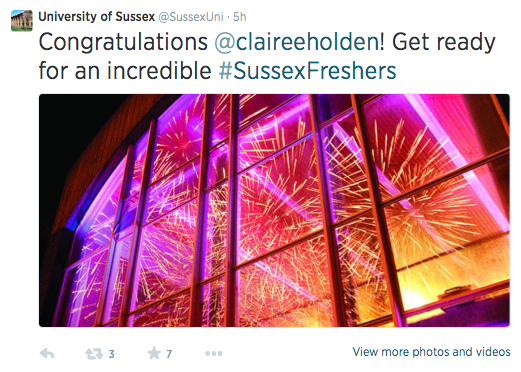 The University of Sussex was one of many that made it personal for lots of successful students. 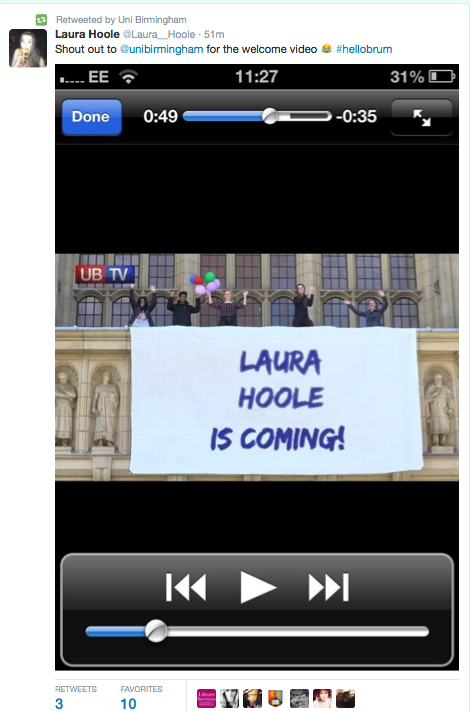 Claire Holden was certainly pleased enough to retweet her celebratory note. The best welcome picture we saw came courtesy of the University of Birmingham and their #HelloBrum campaign. It doesn’t get much more personal than a personalised banner like this (software trickery? surely not!) and Laura was happy enough to tweet her thanks. But personalisation is also about making communication as clear as possible for its intended target audience, and so we think the Teesside University campaign should get a mention for doing exactly what it said it would do – make it simple. Everything about it suggests it’s all very straightforward and the 24 hour helpline combined with campus event at the weekend is indicative of a ‘student first’ approach. Simply put, it’s much more personal. We live in a world of 24/7 tutorials. If we want help with anything we Google it. Invariably we find the answers on YouTube, in a blog, forum or infographic. So it was no surprise to see Universities populating the Cloud with a plethora of guides to Clearing. UWE Bristol stepped up to provide an infographic insight into the Clearing process. You can see the whole thing here. The University of Sunderland did something similar but with their own humorous twist, using Cliff the ‘mysterious’ Seagull as the hero of the story. Cliff wants to ‘make waves in the Business World’. And why not indeed. 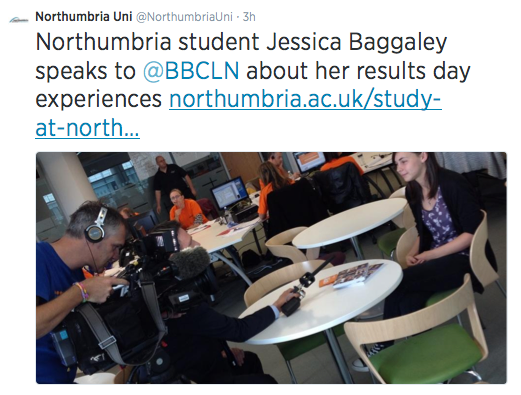 Universities were also recogniising the value of peer-to-peer help so it was no surprise to see some great ‘student voice’ content from Northumbria University and others. And there were also the students who just had to pass on the most important tips, such as how to get to sleep the night before #ResultsDay. 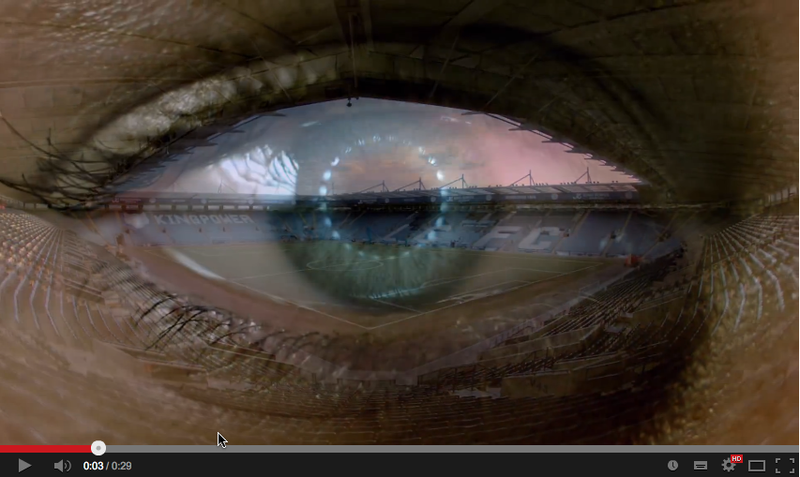 The student-led ‘Uncovered’ blog at Coventry University did a particularly good job. Yes, the Selfie is still trending. It was never really going to be a quick fad anyway. Just as taking photos one way round stuck with us for over 100 years, so will taking them the other way. The Selfie has become a particularly useful tool in the world of HE Marketing, and was again prominent on #ResultsDay, with a number of universities sharing the joy that only a smartphone inches from a face can really achieve. 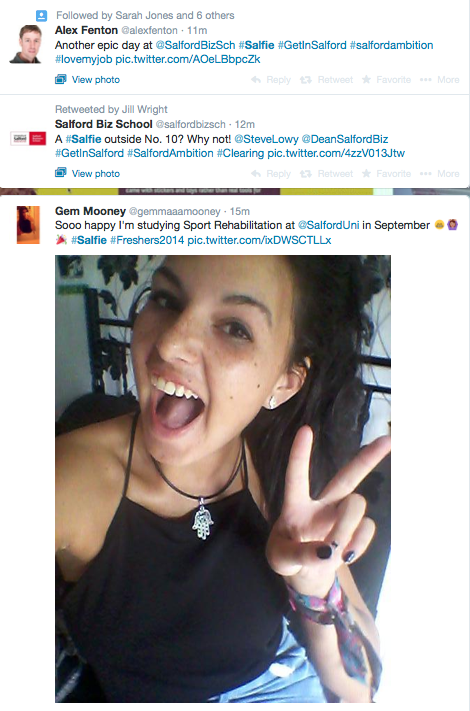 The University of Salford’s #salfie (see what they did there) reached out to their new intake, to existing students, staff and alumni. And successfully so. We saw #salfies from all 4 groups in the short time we looked. The Selfie was big news in 2013. But in 2014 it was on steroids. Most university feeds were awash with grinning faces – on Twitter, Facebook, Instagram or packaged up in the likes of Storify. Every Selfie needs a hastag though and the Social Web was awash with the likes of #GetinSalford, #loveUSW and #HelloBrum. Of course, hashtags can be a playground for the more creative-minded students. 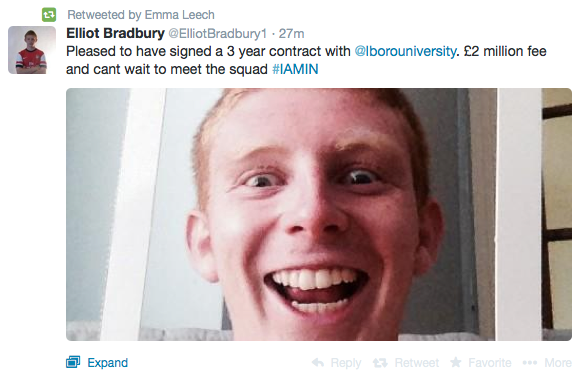 Loughborough University’s #IAMIN entertained its own football parody. But it wasn’t just the students providing the humour. The team at the University of Sussex were happy to share an American WorldStarHipHop Vine to celebrate how their new studets should be feeling. Whilst technically not a Selfie, a ‘Vine’ can work in very much the same way, but over 6 seconds. If you have that kind of time on your hands you can see the original here. It was refreshing to see a number of Universities doing their best to showcase the reality of being a student at their institution. After all, #ResultsDay and #Clearing2014 were still very much about making decisions and any insight into the future would have been well received. Birmingham City University clearly put a lot of effort into their video of the whole student experience and whilst the adventure lasts 10 minutes, it’s broken down into easily digested chapters. It’s great to see students like Sam presenting the information too. 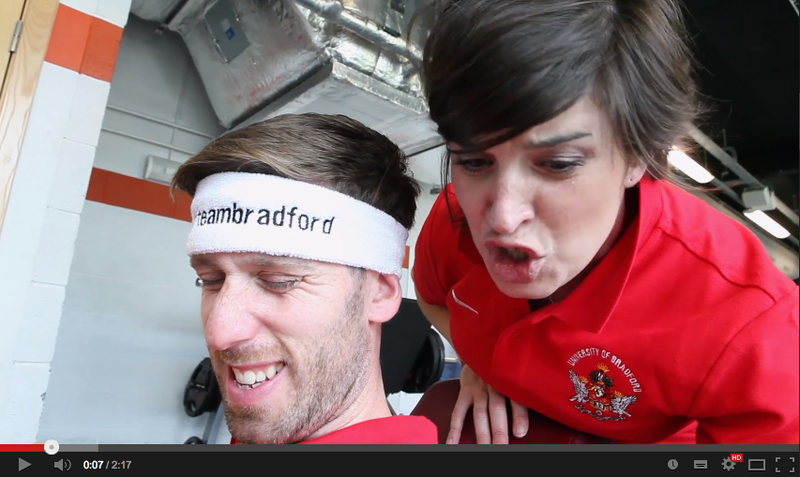 If you want some inspiration of the shorter variety then the University of Huddersfield’s #HudFreshers video does a great job in catapulting a new student into the exiting first couple of weeks of University life – not bad for 1 minute and 10 seconds of work! You can see the trailer here. Whilst August 14th was awash with helpful information and exciting images, it was also an opportunity for Universities to make their pitch to students. After all, it is increasingly competitive out there. 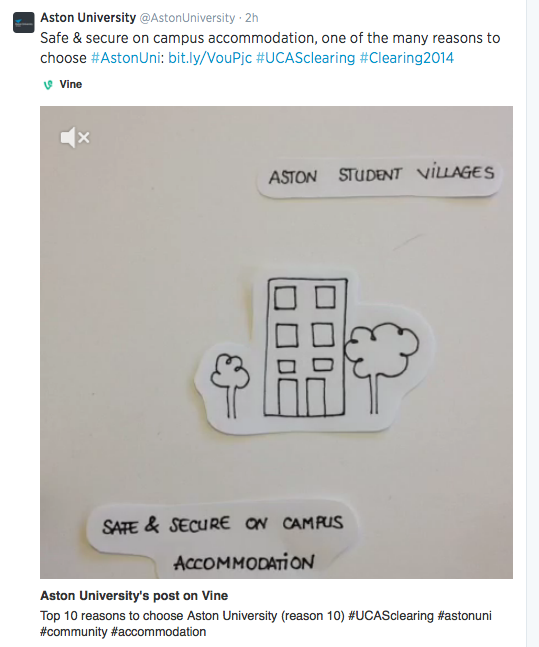 Aston University did this with ’10 reasons you should choose Aston’ , but also imaginatively tweeting 6 second Vines to reinforce the points. The Department of Politics and Public Policy at De Montfort University took the opportunity to promote their student-led, manifesto-style ‘100 Ideas to Change Britain’ video – a fascinating insight into a live University project. We keep getting told that students want to see the reality, so it certainly makes sense to showcase it on such a key date. 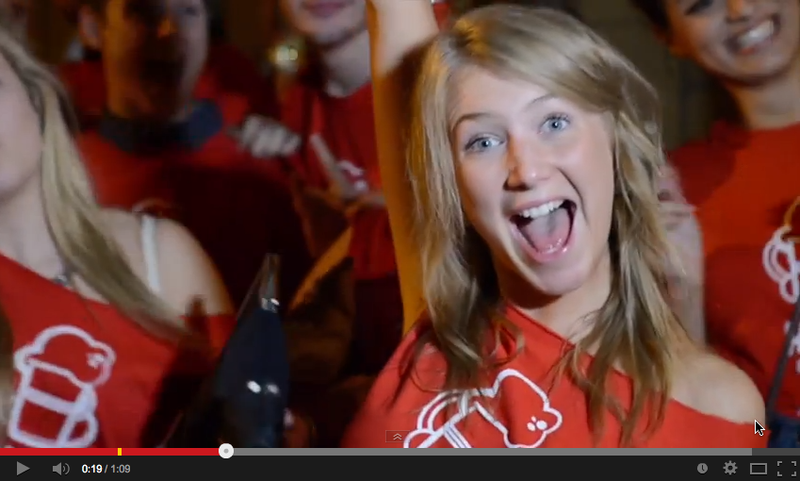 The University of Essex pushed their own agenda right into the heart of the Social Web too. 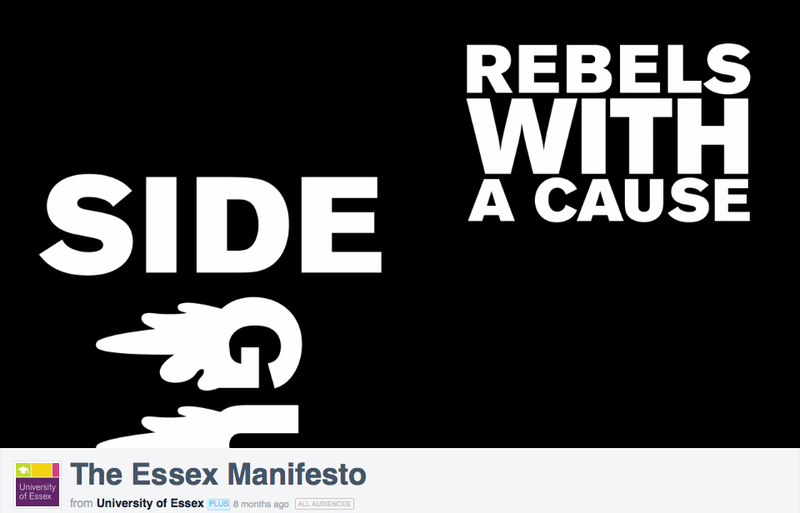 Their ‘Essex Manifesto’ video is full of big statements, purpose and vision, encouraging the ‘bold’ and the ‘brave’, the ‘rebels with a cause’, to sit up and take notice. Finally, back to De Montfort University who used the noise of #Resultsday and #Clearing2014 to amplify their own bigger story to students out there, choosing the same week to launch their highly polished and powerful film campaign. They also tweeted encouragement to see the story behind the 30 second TV ad, including how they captured different pieces of the University brand vision frame by frame. We all know just how competitive the HE sector is becoming. The need for top-class marketing is becoming more and more apparent. So, it was fantastic to see marketing and recruitment teams across the UK putting in such a fantastic, often creative, and sometimes innovative effort. In some examples the desire really stood out. 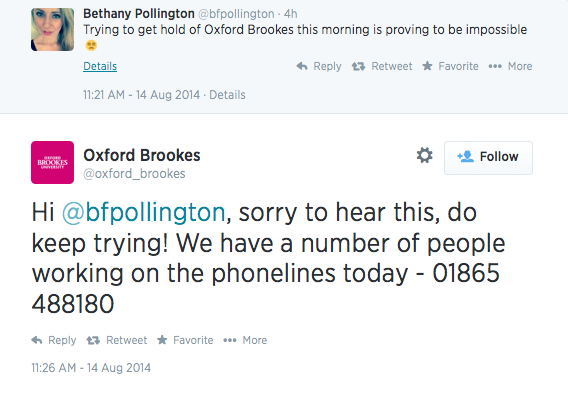 We looked at how Oxford Brookes University were responding to the high volumes of calls and were impressed at the speed of response – within 5 minutes. It was the type of customer service that pioneering brands like KLM would have been proud of. This was just one example of many institutions that were clearly putting the student first. And again, it was great to see students themselves delivering peer-to-peer service. 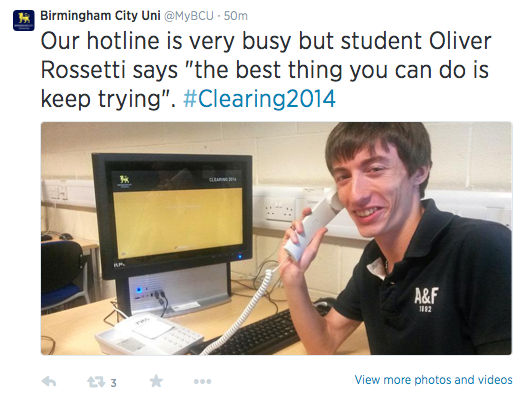 Birmingham City University’s Oliver even tweeted his smile to add an extra dimension of reassurance. Richard Branson would have jumped for joy at that. 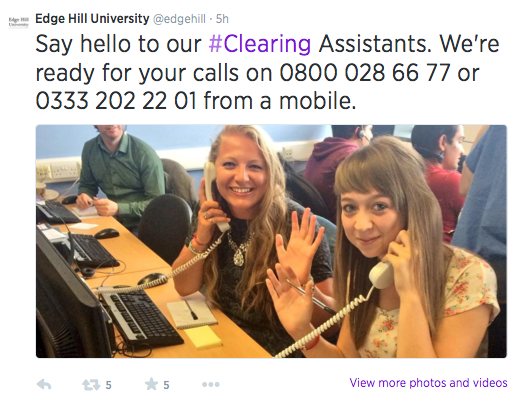 Edge Hill University introduced us to their Clearing Assistants. It’s amazing how a picture can put some people at ease, and great to see Universities recognising just how tense and daunting Clearing can be for students. But it was hard to find a better example of desire than that showed by the team at the University of Bradford who were prepared to run faster and jump higher to provide the best possible Clearing experience. And to prove it, they filmed their fitness drilling and warm up exercises as they got in shape to take the calls – all part of their ‘Good things come to those who don’t wait’ campaign. (Guinness excepted of course!) Great fun and another great example of ‘student first’ customer service. The final word should go to the students themselves. Many took to Social Media to share the funny side. Have a look at some of the funniest posts here. 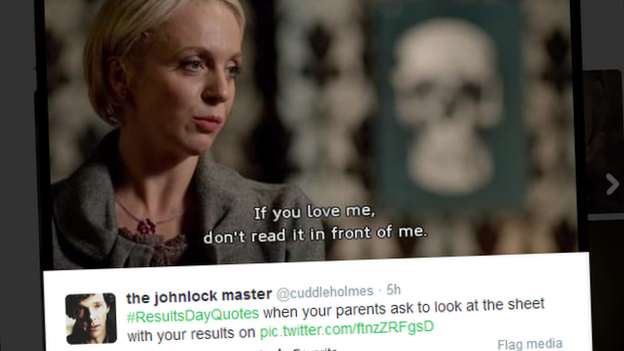 These are just some of the inspiration we found on #ResultsDay in the UK. We’re sure there are lots more out there to learn from and enjoy. We’ll continue to collect these sparks and many more to light up our own Future Index Lab. If you want to know how we can inspire you further, through our events or on your campus, then check out our latest Future Index Academy programme at www.thefutureindex.com/academy. Or dig into our main site www.thefutureindex.com to learn more about how we can help you apply the very latest trends and ideas out there.